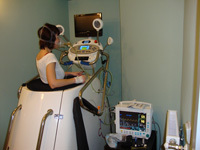 The VacuShape has undergone long-term testing at the Clinic of Sports Medicine in Slovakia. Several groups of people of varying ages, fitness levels, and differing percentages of body fat were monitored. Participants underwent an anthropometric examination. 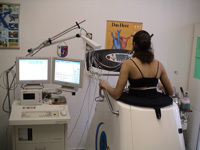 The results of the tests clearly indicate that the consumption of oxygen, expenditure of energy and oxygen ventilation increase whilst exercising in a reduced atmospheric pressure. Energy expenditure increases by up to 50 % in comparison with walking on the treadmill without the use of the vacuum. Fat starts to be burnt sooner and muscle fatigue is not observed as soon because lactic acid, which develops in the muscles during exertion, is removed and metabolised much faster. VacuShape is not only and excellent form of exercise for the general (non-sporting) public, but also for the regeneration of sportsmen and women.